You have said that you would like young people to use Devilish Brain Training. Why is that? With Brain Training, the idea was that as you get older, the brain weakens, but that you can age smartly if you provide the brain with regular stimulation. Well, I should first clarify the differences between the previous Brain Training title and the new title, Devilish Brain Training. Brain Training was designed to improve the processing speed of the user’s working memory11. Devilish Brain Training is designed to increase the working memory’s capacity. When you’re young, your processing speed is incredibly fast, but as you get older, it suddenly slows down. That’s why it’s very important to improve older people’s processing speeds. Young people’s processing speeds are already fast and, while they can get faster still, there is less room for improvement.11 Not all of Brain Training’s exercises were designed to improve the working memory’s processing speed. In this title, exercises that train processing speed are labelled ‘Training Supplements’, while the other exercises are included under the label Brain Training. The working memory’s capacity also decreases with age, but there isn’t that much difference between young and old people. It is often said in psychology that, on average, we can remember up to seven items at once. That was often given as the explanation for why phone numbers had seven digits, wasn’t it? That’s right. Both young people and people aged between 60 and 70 can, on average, remember up to seven items at once. Young people can usually remember seven, eight, or nine items, while older people can remember seven, six, or five – there’s not much difference. With training, however, this number can be several times higher. When doing the n-back exercises, the average person can only remember about two problems back, but this can be increased by around ten times with training. Yes. Increasing the number of things you can remember at once opens up all sorts of possibilities. So while there isn’t generally much of a difference in working memory capacity between young and old people, this capacity can be extended by quite a lot, and it’s young people who can enjoy the greatest benefits. 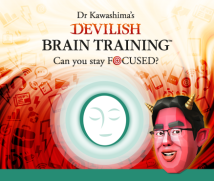 Considering you made Devilish Brain Training partly for yourself, Dr. Kawashima, I suppose you wish you had come across it when you were younger. I do. The potential for improvement is such that I’m confident I would be in a different place right now if I had used this software when I was younger. Working memory is about a lot more than just how many digits of a phone number you can remember, isn’t it? The difference between those whose working memory is capacious and efficient and those with smaller, less efficient working memories isn’t just that they can hold more information in their head at any one time. 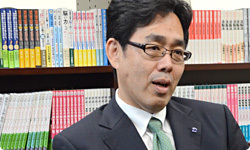 There are also differences in terms of trial and error decision-making, and in terms of combining things effectively. For that reason, regardless of how much knowledge you possess, the depth and breadth of what one can think about within a certain amount of time is different for each person. That’s right. Perhaps people reading this interview would find the concept easier to understand if they imagined a computer system. Brain Training increases the clock frequency12, speeding up processing. Devilish Brain Training, on the other hand, increases the computer’s RAM13 capacity. Without enough RAM, the computer will freeze up, no matter how fast the CPU is. It just can’t take in all the information. 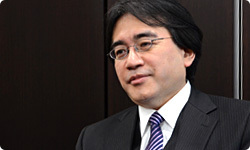 I’m sure you’ve noticed when playing Devilish Brain Training, Iwata-san, that you freeze up and your internal memory becomes volatile.14 (laughs)12 Clock frequency is the tempo at which the processing between each part of a circuit within a computer takes place. The higher the clock frequency, the higher the computer’s processing power.13 RAM refers to ’random access memory’, a form of data storage used by computers.14 Memory that had become volatile vaporises and disappears. The n-back tasks that we mentioned earlier are included in the software under the name Devilish Calculations. You answer the maths problems in the order that they appear, but what’s different is that the answer you have to write at any given time is the answer to a problem that appeared two problems previously, or three problems previously, or four, or five. You have to keep track of the numbers in your head. If someone interrupts you while you’re doing this, your head goes completely blank, and once your memory begins to crumble, it just goes to pieces in an instant. This is a greater state of concentration than is usual in daily life, so it’s an intense five minutes. Yes, you’re absolutely right. I think it’s the first time in my life that I’ve been conscious of my memory simply being wiped. You have something in your mind, and then suddenly it just disappears! In fact, several things disappear at once, and you can’t recall any of them! (laughs) It’s a unique feeling. That’s exactly like volatile memory!15 (laughs) It’s just like RAM, you can’t store information forever. With Devilish Brain Training, it’s possible to increase your capacity so that it sticks better, though.15 Volatile memory refers to a type of semi-conductor memory, the contents of which disappear when the computer’s power is turned off. Even if you just had all the numbers neatly lined up, as soon as someone else starts to speak, their words just seem to overwrite the numbers. This happens because you don’t have enough space, doesn’t it? Exactly. If you’ve got plenty of space, you can continue to process the numbers without faltering, even if someone starts talking to you. Old computers couldn’t perform parallel processing, but it isn’t a problem now they have more RAM. Our brains are like old computers, but after using Devilish Brain Training it feels like your brain has been upgraded to a modern operating system!